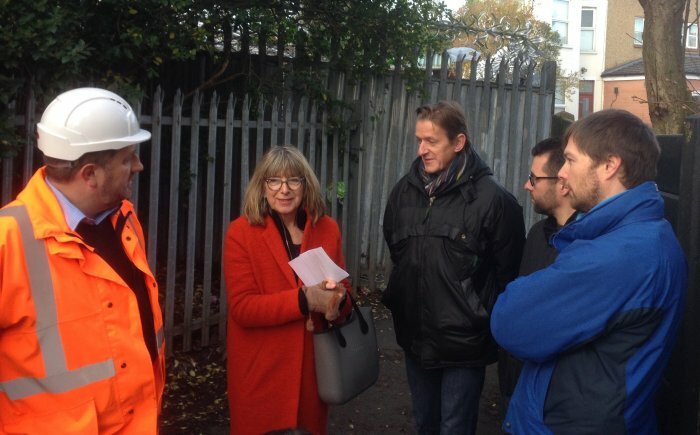 Months of recent community work and lobbying came to some fruition on Tuesday 20th with a site visit to the Black Path and meeting with local residents by representatives from Network Rail, the British Transport Police, Camden Council and the West Hampstead Safer Neighbourhood Team. 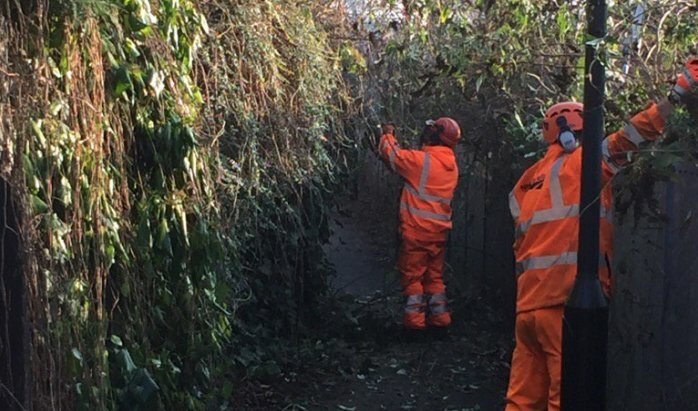 They were joined by two very welcome maintenance workers from Network Rail, who were armed with machinery more suited to the task of cutting back years’ worth of overgrown vegetation than that with which we came to the WHL-organised community clean-up day back in September. As a result regular users of the path will notice a huge improvement in some of the most obstructed stretches. David Rose, from Network Rail’s East Midlands team and Tim Ramskill, who works on crime prevention for the BTP, came to discuss safety and maintenance issues on the path. In the wake of a small number of attacks on the path in the last few weeks, Jim Craig and Simon Bishop from the SNT were on hand, as was Fortune Green councillor Richard Olszewski – who himself uses the path regularly. Personal security and the vexed question of overhanging vegetation were top of the agenda of course, but discussion points also included safety issues around the tarmac surface, walls and lighting, as well as ownership and responsibility for the path itself. L-R, Network Rail’s David Rose, local resident Julia Deakin, Cllr Richard Olszweski, Simon Bishop and Jim Craig from West Hampstead SNT discuss safety and maintenance on the Black Path. Mr Rose was able to confirm that Network Rail owns all the land from the railway line up to – but not including – the walls and fences that border the backs of gardens along Sumatra Road, which belong to the respective property freeholders. However the path itself (not including fences on either side) is leased to Camden, so the council is responsible for the surface, lighting and security. 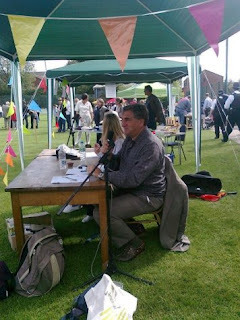 He also raised the question of what might happen if or when government policy forces Network Rail to sell off the land in the future; an unknown quantity obviously, but a potential concern if the path were to fall into private hands and be taken out of public ownership. The SNT told us that it is currently advising people not to use the path for the time being whilst their investigation into the recent attacks is is ongoing. If you do choose to continue using it, the police recommend carrying a personal alarm. All at the meeting agreed that installation of CCTV would be hugely helpful, but cost and logistical issues may make this unfeasible: the path is 500 meters long and would have to be cabled all the way, even before accounting for the expense of upkeep. 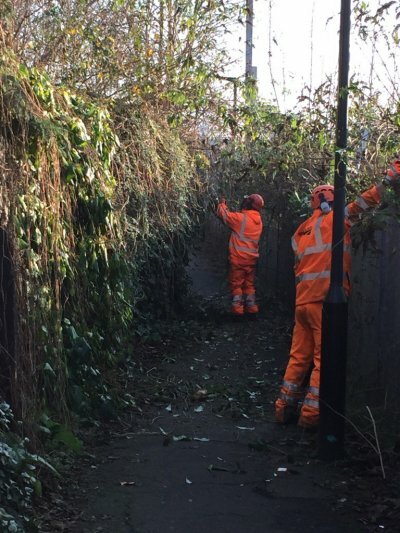 Whilst some of the worst of the overhanging tree growth was cleared by the Network Rail team and their chainsaws, many of the most obtrusive plants are impossible to deal with effectively from the path and would need to be tackled by their owners from within Sumatra Road gardens. By coincidence, later that same day, detective work on the part of a particularly diligent local campaigner revealed that the freeholder of one of the worst-offending gardens is a West Hampstead businessman. Residents are now urging Camden to issue an enforcement notice to the freeholder in order to oblige him to maintain his garden and repair its damaged fence, which intrudes onto the pathway. It was a productive meeting that ended with a real sense that all the stakeholders were engaged with the problems faced on the path as well as other local Network Rail-owned properties, such as Billy Fury Way, and that solutions could be found for some of the most pressing issues. 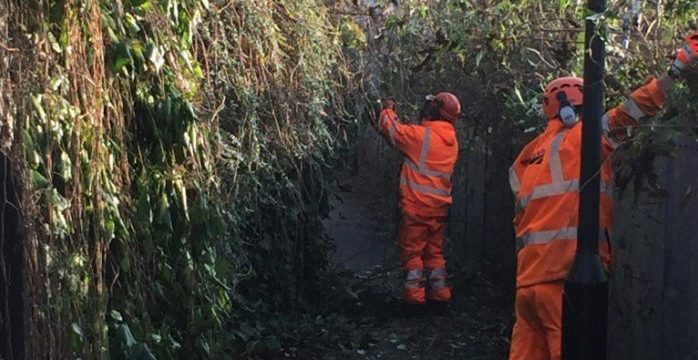 With vegetation cleared, sightlines would be improved along the whole length of the Black Path, giving better visibility both to pedestrians and cyclists – and fewer places in which to hide. There will be further challenges along the way, as budgets continue to be slashed both at Network Rail and Camden, but the willingness at least is clearly there.